This still from a NASA broadcast shows the Delta 2 rocket carrying NASA's twin Grail moon gravity probes on Sept. 10, just one hour away from a morning launch attempt - the second liftoff try for the mission. Windy weather has once again thwarted NASA's attempt to launch two gravity probes to the moon today (Sept. 10) on a mission to study the inside of the moon and its gravity field. 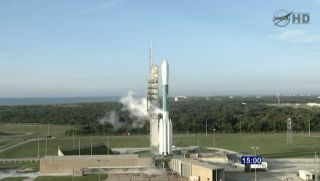 The two Grail spacecraft were scheduled to launch on an unmanned Delta 2 rocket from the Cape Canaveral Air Force Station in Florida this morning at 8:29 a.m. EDT (1229 GMT), but stubborn high-altitude winds – the same thing that forced NASA to stand down during initial launch attempts on Thursday (Sept. 8) – caused yet another delay. Another chance on Friday (Sept. 9) was called off to give engineers time to assess the rocket's propulsion system after a potential glitch was detected. After a series of reviews, the team concluded that there are no issues with the rocket or its propulsion system, NASA officials said. The $496 million Grail mission will closely analyze the composition of the lunar interior, and the twin probes will make detailed and precise maps of the moon's gravitational field. The three-month expedition is expected to help scientists uncover clues of the moon's origin and evolution. Grail's observations should also shed light on how other large, rocky bodies in the inner solar system were formed.